. 弁天と伝説 Legends about Benten . She is also sometimes mixed up with the God of Water. In India, the sound of her lute is said to evoke the sound of a flowing river and thus provide rain for the dry areas. 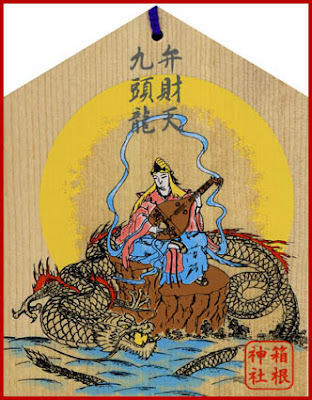 The sea goddess Benzaiten is the sole female among the Seven Lucky Gods of Japan. 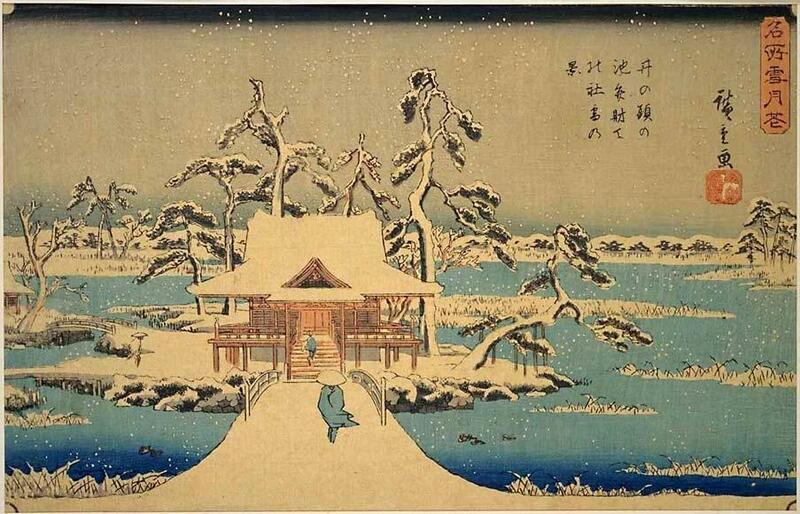 Her temples and shrines are almost invariably in the neighborhood of water -- the sea, a river, or a pond. 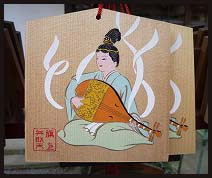 She is the patroness of music, the fine arts (dancing, acting, visual), and good fortune in general, and is often shown carrying a biwa (Japanese mandolin) or playing a lute. She is often represented as a beautiful woman with the power to assume the form of a serpent, or shown seated on a dragon or serpent and playing a lute. 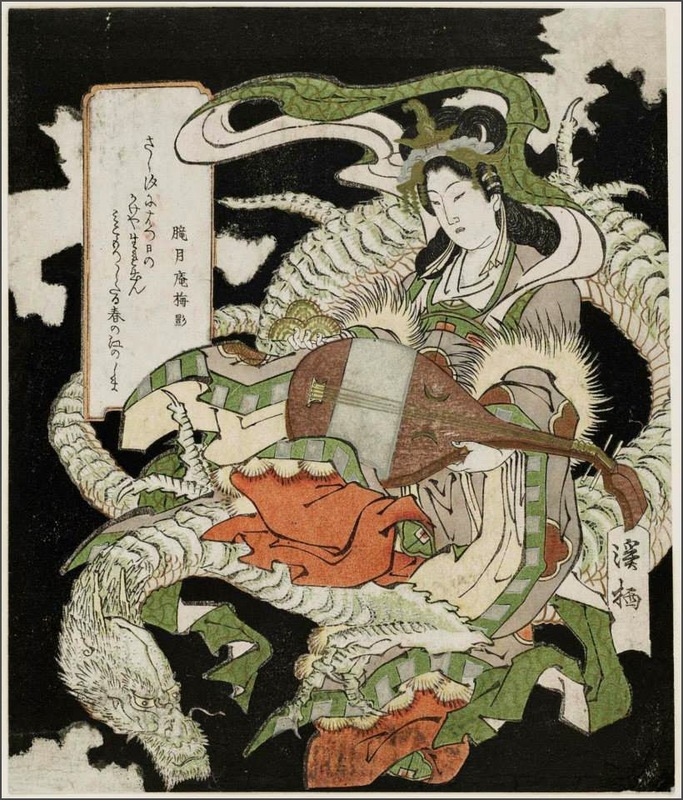 In fact, the snake is almost always associated with Benzaiten, who was originally a Hindu deity (Sarasvati) who represented learning, music and poetry. Such artistic learning and wisdom often bring prosperity, hence her inclusion in the Japanese group of seven luckies. She also has a jewel that grants desires. Some say it is a jade, while others say it is a pearl. the goddess of knowledge, music and art. at Zeniarai Benten　銭洗弁天, Kamakura on the first day of the snake in the new year. Benten is related to the God of Snakes and Serpents, and the favorite food of this animal are eggs. So at the shops around Zeniarai Benten they sell boiled eggs as offerings, to have your wish come true. "Benten Boiled Eggs" are served at some Benten shrines on the evening of December 31, then people line up to ring the bell into the New Year. a deity of good fortune and wealth. Most sources believe Ugajin is none other than Uga no Mitama, the Shinto goddess of foodstuffs mentioned in Kojiki and Nihongi, two of Japan's earliest records. 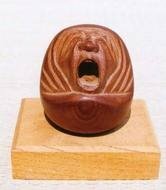 Uga no Mitama is also commonly identified with a male counterpart named Uka no Mitama, the deity of grains. This Shinto pair are further identified with Inari, the parent Shinto god/goddess of rice and agriculture, who is identified with a white fox as his/her messenger.
. Uga no Mitama no Kami 宇賀御魂神 . "'Benten Musume Meo no Shiranami'"
. . . CLICK here for colorful Photos ! Benten musume 弁天娘 "Lady Benten"
They come in the form of old coins. Dough filled with sweet bean paste, pressed in the form of the Seven Gods of Good Luck, including our Benzaiten.
. Shichifukujin　七福神 - Amulets . Her amulets grant beauty, good health and a long life. 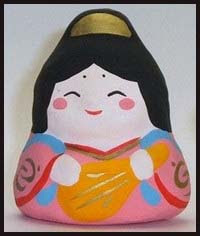 Amulet to become a smiling beauty and mother. A small sanctuary in the temple compound. 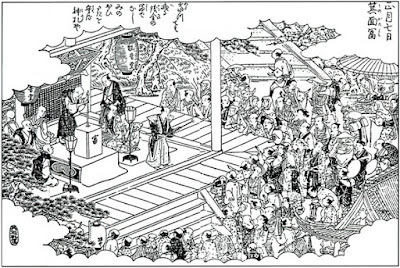 大己貴命 Oanamuji no mikoto , 天照大神 Amaterasu Oomikami, 倉稲魂命 Uka no Mitama no Mikoto (Uganomitama), 埴安姫命 Haniyasu Hime 、少彦名命 Sukunahikona no mikoto. A tutelary kami of earth. 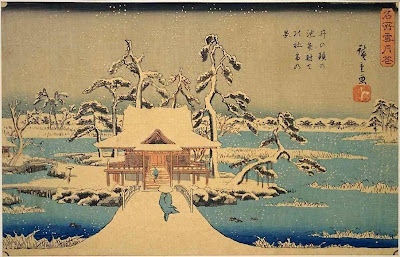 According to an "alternate writing" recorded in Nihongi, Haniyasu no kami was produced by Izanagi and Izanami after they had completed giving birth to the "Great Eight-Island Country" (Ōyashimaguni). The name haniyasu is thought to mean "to knead earth so as to make it soft." Kojiki relates that the two kami Haniyasubiko no kami and Haniyasubime no kami were produced from Izanami's feces. 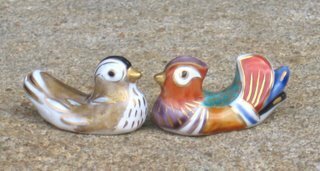 Kami with similar names include Haniyamahiko and Haniyamabime, two kami thought to have the same divine virtues and powers (shintoku), and which are collectively known by the name Haniyasu no kami. Haniyasu no kami is worshiped even today alongside other deities, frequently on the occasion of groundbreaking rituals (jichinsai). 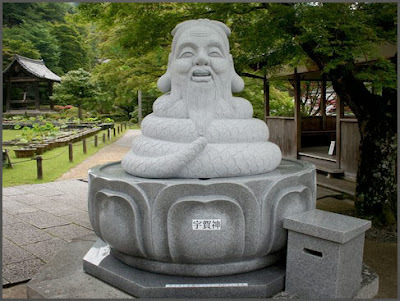 ..... hatsu Benten 初弁天（はつべんてん） "first Benten"
hatsu mi 初巳 (はつみ) "first snake"
Minoo City is located near Osaka, between Kyoto and Kobe. At the temple Ryuan-Ji (Ryuuanji, Rooanji 箕面山滝安寺吉祥院) there is a famous lottery every year, since the Nara period. 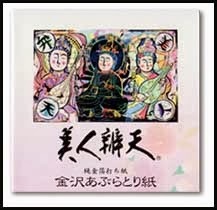 There are also poems of the Kamakura period about this lottery. People buy a ticket (tomikuji宝くじ), write their name on it and put it in a box. When all have finished, a priest sticks a sharp pole in the box to pick out the first ticket, the BIG LUCK, daifuku 大福. The person who won the first ticked now had to rush home without sleeping on the way, to ensure the good luck would not diminish. The winning tickets bring good luck in business, health for the whole family and good fortune in general. 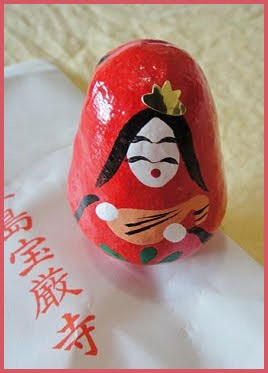 They were considered as a good luck talisman 大福御守 from the temple. The second and third winning lottery ticket were also considered very auspicious. Other temples later imitated this kind of lottery, but when it became "big business", the government of the Eod period forbid it. Still, lottery was carried out secretly. At the Benten hall 弁天社 of this temple tomikuji 富籤 were sold. At this shrine lots for the female Benten and the male Ox deity Go-Oo 牛王 were sold. 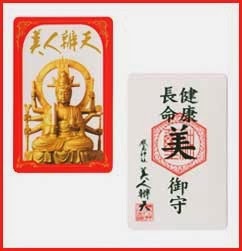 the Seven Gods of Good Luck.
. Somin Shorai Fu 蘇民将来符 Somin Shorai Amulets .
. tomikuji, takarakuji 宝くじ　/ 富籤 lottery . 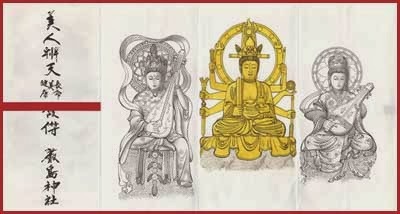 Nowadays,the Great Festival of Benzaiten at the temple Ryuan-Ji is on October 10. Feld- und Flußgöttin der alten indischen Mythologie. Wasser war in Indien eine Kostbarkeit und mit dem Saiteninstrument BIWA wurde versucht, die Geräusche von plätscherndem Wasser nach~zu~ahmen. Daher hat Benten oft eine Biwa (Lautenart) in den Armen und wurde später in Japan zur Göttin der Musik, Literatur und Sprachgewandheit; auch Reichtum, Gesundheit und langes Leben. Als Gottheit der Künste auch folgende Bezeichnungen: Bionten 美音天, Myooonten 妙音天, Myooten Ongaku 妙音天音楽, Daibenten　大弁天, Daibenzaiten　大弁才天, Daiben Kudokuten 大弁功徳天, Daibenzai Kudokuten 大弁才功徳天. Die shintooistische Version der Benten ist die Gottheit Itsukushima Hime no Mikoto. Zur Vermehrung des Reichtums wird Geld in einem Teich der Benten gewaschen (Zeniarai Benten　銭洗弁財天) oder ein altes Goldstück (koban　小判) in der Geldbörse aufbewahrt. Der Bote der Benten ist eine Schlange; eine Geldbörse aus Schlangenleder ist besonders begehrt. Benten ... Wassergottheit ... Schlangenleib mit Menschenkopf ... Schlange ...　Drachen. Ab Kamakura-Zeit Benzaiten genannt und als Göttin für Wohnen, Essen, Trinken und Reichtümer verehrt; ab Muromachi-Zeit auch eine der sieben Glücksgötter. Herabhängende Haare oder Knoten. Im aufgesteckten Haar ein weiterer Kopf oder eine Schlange mit Menschenkopf (Ugajin). mit Pfeil, Bogen, Schwert, Axt, Donnerkeil, Stab, Rad der Lehre und wunscherfüllendem Juwel. Es gibt sechs berühmte Benten-Statuen mit acht Armen, eine davon befindet sich als Geheim-Figur in Enoshima. 7. Glücksgöttin als nackte weiße Frauengestalt mit einer Biwa. Die nackte Gestalt wurde manchmal mit reichen Frauengewändern umhangen. Aikyô Dôji 愛敬 : Pfeil und Bogen. Gyuba Dôji 牛馬 : Ochs und Pferd. Hanki Dôji 飯櫃 : Auf dem Kopf ein Gefäß mit Reis. Hikken Dôji 筆硯 : Pinsel und Tuschestein. Inyaku Dôji 印鑰 : Im rechten Winkel gebogener Schlüssel. Ishô Dôji (Inyaku) 印鑰 : Mit zusammengelegten Kleidungsstücken. Juusha Dôji 従者 : Drei Juwele. Kantai Dôji 官帯 : Gürtel für Festlichkeiten. Keishô Dôji 計升 : Viereckiges Reismaß. Konzai Dôji 金財: Waage zum Goldwiegen. Sanyô Dôji 蠶養 : Gefäß mit Seidenraupen. Sensha Dôji 船車 : Schiff und Lastkarren. Shômyô Dôji 生命 : Schwert und Juwel. 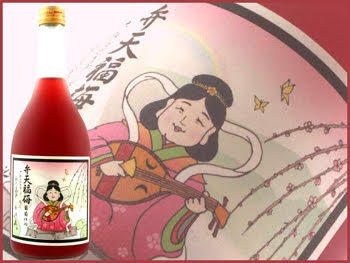 Shusen Dôji 酒泉 : Krug mit Reiswein. 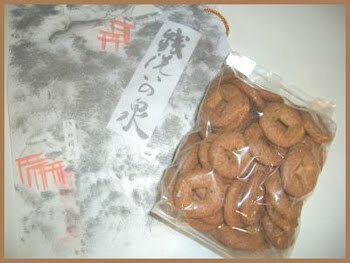 Tôchuu Dôji 稻籾 : Reisballen. Zenzai Dôji 善財 : Sack (mit Goldstaub). Aikyô Dôji ist wahrscheinlich eine Version des Cupid. Zenzai Dôji als eigenständige Figur wird im Kegon-Sutra erwähnt. Er ist das reinherzige Kind einer wohlhabenden Familie. Als er die Lehre des Monju Bosatsu hörte, bekehrte er sich und studierte unter Monju. Er errang großes Wissen und erlangte schließlich die Erleuchtung. 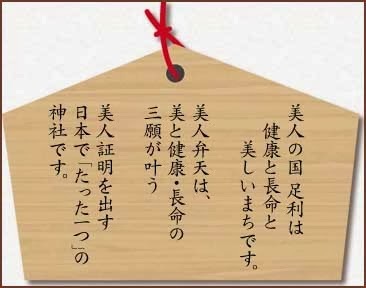 Es gibt Abbildungen in Mandalaform dieser Lebensgeschichte des Zenzai Dooji seit der späten Heian-Zeit (Kegon Kaie Zenchishikizu Mandara 華厳海絵善知識曼荼羅).
. . . CLICK here for Zenzai Doji Photos ! Jeder dieser 15 Knabenfiguren ist als ursprüngliche Gestalt ein Nyorai, ein Bosatsu und ein Ten zugeordnet. is a stone statue located in back of Hokyointo (stone stupa) in Hashiori Pass on the Nakahechi route of the Kumano Ancient Road. The statue is only 50 cm tall but it is a symbol of the Nakahechi route. Next to it stands the statue of En no Gyoja, the founder of mountain practice. It is said that the figure represents the tragic Emperor Kazan on the pilgrimage to Kumano Shrine. Emperor Kazan ascended the Imperial throne at a young age in the middle of the Heian period (794-1192) but was tricked into abdicating by the Fujiwara family’s conspiracy. After his abdication, he became a Buddhist priest and was given the appellation of Hoo (pious ex-emperor). The name of the pass, Hashiori (literally meaning “breaking chopsticks”), is derived from the old story that when the emperor’s party had a meal at this place, they broke stems of Japanese pampas grass and used them in place of chopsticks. Gyuba Doji statue keeps on giving a gentle look to the pilgrims on the Nakahechi route. On June 20, 2008, citizens of Tanabe City learned of the defacing of the statue known as “Hashiori Pass Gyubadoji.” The Chinese characters for Gyubadoji can be separated into the parts – Gyu meaning cow, ba meaning horse, and doji meaning a child (in this instance, the young Ex-emperor, Kazan-in). This statue is on the Nakahechi section of the Kumano Kodo World Heritage pilgrimage route and is often used as a symbol of the Kumano Kodo. This pilgrimage trail stretches from Kyoto to Nachi in the south of Wakayama Prefecture with the Nakahechi area. Gyubadoji is on the first section of the route after it turns inland towards the first of three grand shrines, Kumano Hongu Taisha. It is little more than a twenty minute hike from the main highway leading to Hongu-cho and Kumano Grand Taisha, and it is a relatively easy hike which is popular with visitors to Kumano. The statue was defaced with the head of Kazan-in, a retired emperor from the 10th century, being taken. Torii in front of a Benten sanctuary are very popular, although torii are usually only found at the entrance of a Shinto shrine. 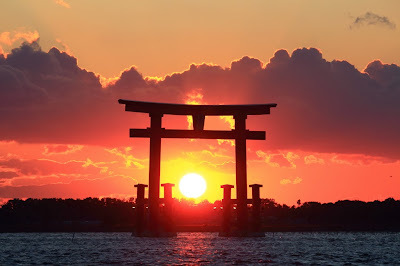 Torii are also found at the entrance of sanctuaries dedicated to the group of TEN 天部, the devas, many of them coming as deities from India. Today is Saraswati puja. Saraswati is the goddess of learning, wisdom, art, culture, dance and music. Seated on a white lotus, the goddess is believed to have 'veena', a musical instrument used till today, in her hand and is therefore known as Veenapani (pani means hand). In Indian calendar it is Basant Panchami, Basant means spring and panchami is the fifth day. This is the birthday of the goddess. Aikyô Dôji, Aikyoo Dooji 愛敬童子 Aikyo Doji - one of the 15 attendants of Benten with bow and arrow. He represents military class and also the god of love 敬愛和合. 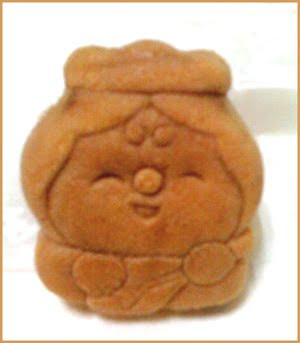 He is also called Sekon Doji 施願童子. ajimi Jones Aoi Tokugawa) also went to what is locally known as "Benten Pond" dedicated to the the Goddess Benten or Benzaiten (弁才天 or 弁財天), more formerly referred to by the name Ichikishima-hime-no-mikoto (市杵島姫命),is the goddess of everything that flows: words, knowledge, speech, eloquence, and music. Said to be the third daughter of the dragon-king of Munetsuchi, over the course of centuries she has grown in her atributes from being a protective deity of Japan, to one who bestows good fortune on the nation and its people. 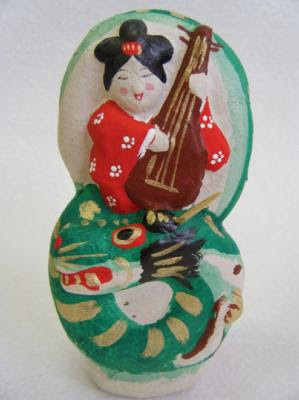 She is often depicted as holding a biwa, a form of Japanese lute. Only the locals, residents of Takiro and Ichinokura know about "Benten Pond" and it's tiny shrine. If one lives in the northern parts of Tajimi, it is likely that they have never heard of it. Historically (but not in modern times) the pond was much larger but like many things, has been encroached upon or naturally and artificially filled in, until here, just a little stream flows through. 飯盛山 Mount Iimoriyama was called 弁天山 Benten-yama, because deep in the mountains there was a small shrine to venerate the deity Benten. Myoo-on boo 妙音坊 Myoon-Bo, Myoonbo. Benzaiten is venerated at the shrine 弁財天社 on this mountain. 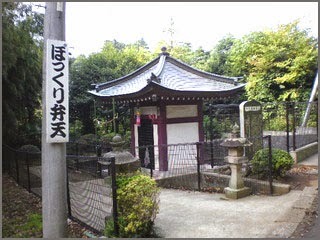 Myoon-Bo Tengu lived on a large cedar tree in the compound and protected the shrine. There is also a statue of 弁財天 Benzaiten, carved by 弘法大師 Kobo Daishi. 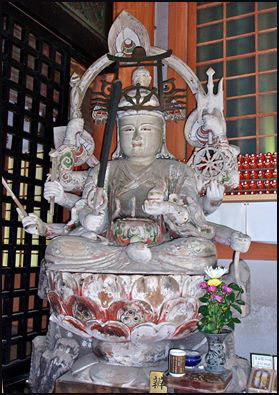 Kukai carved two statues of Benzaiten, the other one is at Chikubushima 竹生島 in lake Biwa. North of the home of 小林角蔵 Kobayashi Kakuzo is the oldest shrine for the deity Benten, 弁天ヤシキ Benten Yashiki. When he tried to make some fields there, his house almost burned down. The Benten Deity later moved on to Mount 筑山 to the 雷電沼 Raiden-numa swamp. Fuyukiya 冬木屋 was a lumber merchant. The first Fuyuki had come from Gunma. His name was 上田直次 Ueno Naoji. The third owner was 冬木屋弥平次 Fuyuki Yaheiji, who established a large lumber yard here. In 1705 Fuyukiya Yaheiji became the head man of district, which was then named after him. 冬木弁天堂 Fuyuki Benten was the shrine of the Fuyuki family. At the town of 溝呂木 Mizoroki there was a place named ワクタマ Wakutama where clear water came out of the mountain. Beside it was a small Shrine for Benten, the Deity of Water. If people pour water on the Shrine, it would soon start to rain.